More than a Custom Vinyl Shop! We are happy to announce we will be carrying several brands of turntables and accessories in our store. You need the gear to listen to your custom made vinyl records, right? To celebrate we will be offering a brand new turntable by Crosley. They have really stepped up their game with this one. 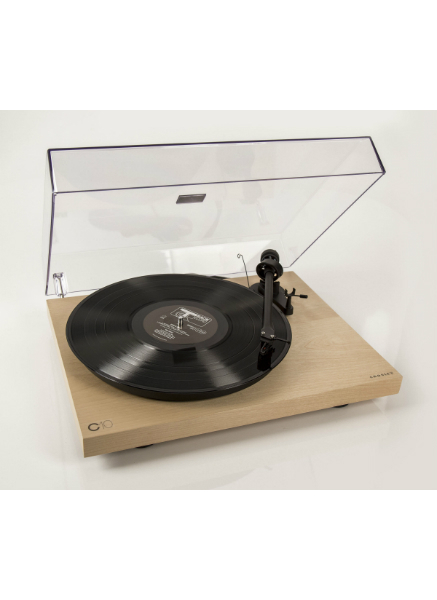 This turntable is for the vinyl enthusiast who wants to experience the quality and detail of their vinyl collection. It's simple design features a low vibration synchronous motor and shock absorbent feet to reduce vibration for superb sound quality. The tone arm is equipped with an Ortofon OM5e cartridge, adjustable counterweight and anti-skate adjustment. This turntable is released starting today and in very limited supply. And for a short time we are offering $50 off so don't wait if you want to step up your vinyl listening game. This is a brand new design by Crosley. Just released August 18! Crafted for the vinyl enthusiast whose looking to take the next step in their vinyl experience, Crosley’s C10 is perfect for enjoying the distinctive warm sound of vinyl. This sleek turntable comes equipped with a low vibration synchronous motor and shock absorbent feet for reduced vibration and superb sound quality. The aluminum tone arm is equipped with an adjustable counterweight, anti-skate adjustment and a pre-mounted Ortofon OM5e cartridge for superior audio reproduction. With a simple design and audiophile components, the C10 provides high-performance experience for true vinyl lovers. Posted on August 18, 2015 by Chris Bell and filed under turntables, Store.